Salam Aidilfitri to my friends who are celebrating the Eid Festival. This week in August has so many things going on that I forgot to wish my friends a Happy Eid. And I am still awaiting for your invitation to open houses and makan etc., hehehe (pulling a cute Puss in Boots look with a sign across my forehead saying 'thick-skinned'). Anyhow, with a little bit of luck, we might be able to catch 'free fireworks' from the sky, i.e. the Perseid showers. This meteor shower are the result of debris from the comet Swift-Tuttle entering our atmosphere and burning up. The night of 12th August to the morning of 13th August has been said to be the best nights to observe the celestial display, provided that clouds do not obscure the view. The radiant (apparent origin) of this shower is in the constellation Perseus. This means that the streaks of light will appear to originate from an area of the constellation Perseus. Hence the name Perseid showers as meteor showers are always names after the constellation where the radiant lies in. 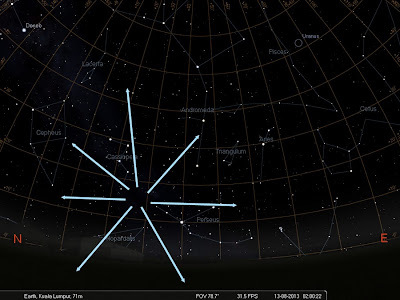 From Kuala Lumpur, due to our equatorial position, the constellation Perseus does not rise above horizon until past 1am in the morning (i.e. 1am on 13th Aug) . Hence viewing would be better in the wee hours of the morning and up till dawn. Also the waxing crescent moon sets after 9.30pm, thus giving us a dark sky that is more conducive for viewing. 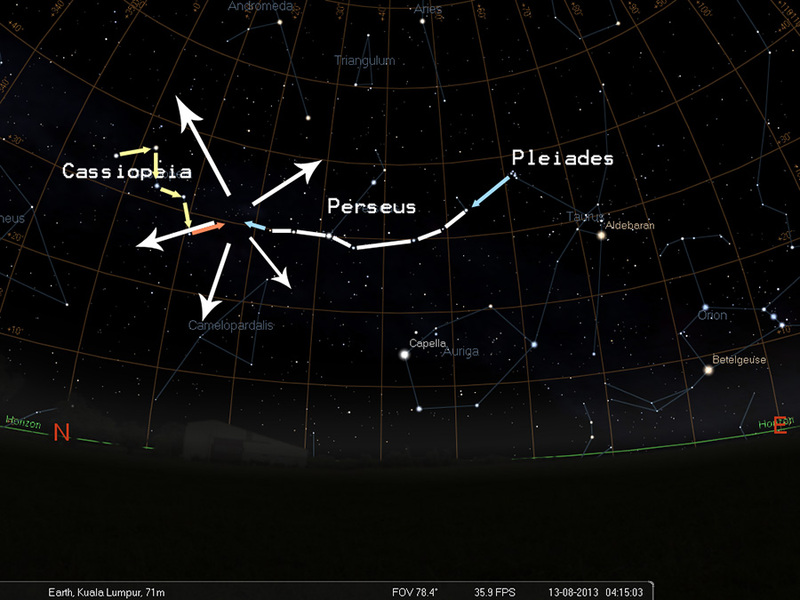 The Perseid radiant is just 15o above the horizon at 2am in Malaysia (made with Stellarium software). 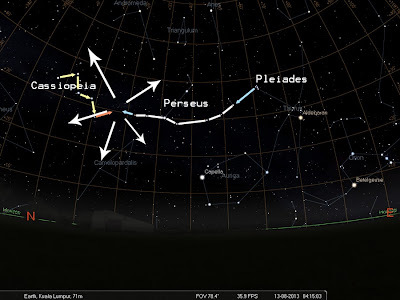 Notice that the direction that Perseus rises from is north-easterly. 15o is approximately the distance between your pinkie and index finger stretched out when held to the sky; so if there are hills (like viewing from KL towards north-east), you still won't be able to see the radiant at 2am unless you are at Genting Highlands! If you cannot see the radiant point it does not mean that you cannot see the shower. Rather, you will only see very much less trails than the average count. It is just like looking at a fireworks display that is blocked by a row of trees, you will only see the fire trails that travel higher that the treeline. If you want to locate the radiant, you can do so following the diagram below, and only after 2am +8GMT (unless you can see 'through' the horizon and Earth). The Perseid radiant at 4.15am on 13th Aug 2013 as viewed from KL. If you want to look for the radiant, you can either find the Seven Sisters (Pleiades) aka Subaru and follow to the leg of Perseus up to his face (count up 7 stars), and right in front of the face, and at the foot of Cassiopeia, would be the radiant. If not, the W-shaped Cassiopeia is easier to find. Just follow through the zig-zag with another step and you would've have arrived at the radiant. 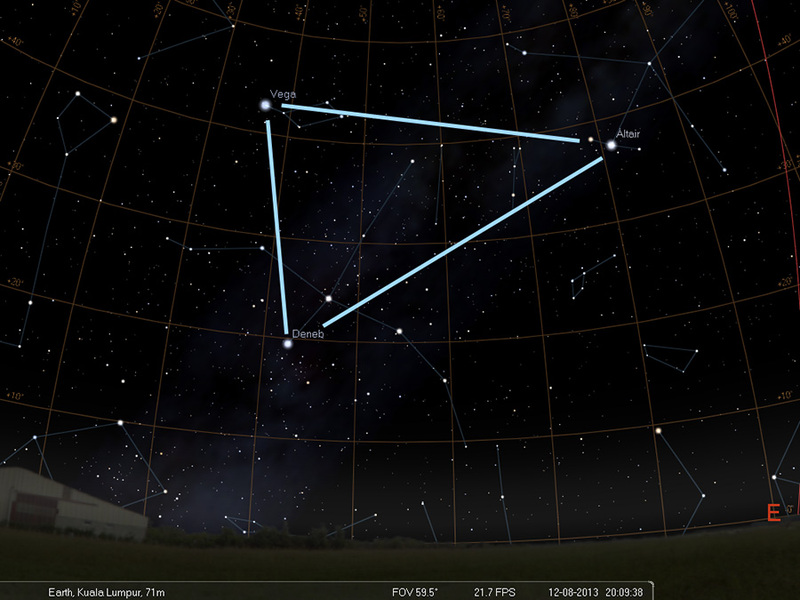 Besides the shower, one can also observe the Summer Triangle, made up of the stars Altair, Vega and Deneb. These are the stars in the constellation Aquila, Lyra and Cygnus respectively, which in Chinese mythology represents the Cowherd, the Weaver Girl and their bridge of magpies (here's an article on the Cowherd and the Weaver Girl I wrote last year). It so happens that 13th August 2013 is the 7th day of the 7th month of the Lunisolar calendar, the Qixi Festival. 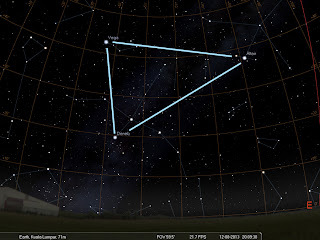 Thankfully the Summer Triangle rises very much earlier in the night, and the best time to view it spans through a duration of several months so one does not have to stay up late or wake up early to see it nor risk missing it due to cloud cover or poor viewing conditions. The Summer Triangle of Vega, Altair and Deneb. 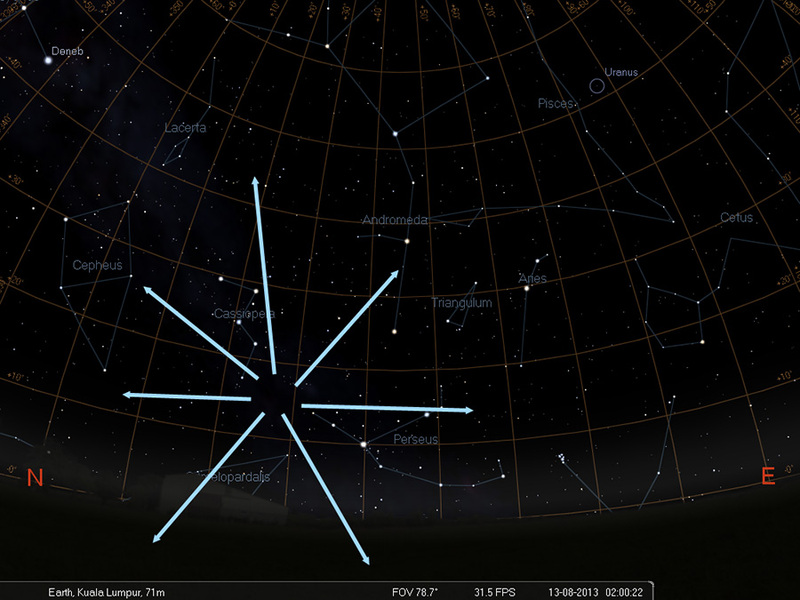 Stellarium image for 8pm Malaysian time as viewed from KL. So here's to the month of August, a month of celebrations with so many festivals and celebrations, from Eid, National Days (Singapore - 9th, Malaysia - 31st, Indonesia Independence - 17th), Qixi, Hungry Ghost and most importantly to kids...school holidays. Thank you for this posting, hehehe...ingat nak tengok tapi time tidur. But will try to enjoy the night sky view tonite with the kids. Haha, kalau bangun awal sebelum subuh, masih sempat nak tengok lagi. Itupun kalau takde awan. Pagi ni mendung kat sini, so tak jadi nak observe.